Westport residents Darcy Hicks and Jeanne Bowles react to speeches at the March for Our Lives demonstration in Washington D.C. on March 24. WASHINGTON, D.C. — The sun had not even risen. Before daybreak on Saturday, about 30 teachers, students, and residents gathered at the Park and Ride area near the Sherwood Island Connector to board a bus to Washington D.C. for the March for Our Lives to demand an end to gun violence. The group came to fruition thanks to Darcy Hicks, a Westport resident who last year founded the resistance organizing group, DefenDemocracy of CT. A former Westport public school teacher, Hicks said she arranged the bus to help raise up the voices of teachers who are directly impacted by gun violence but often don’t have the privilege to engage in political activism because of the financial burden of traveling to D.C, such as for the March 24 march organized in the wake of the Feb. 14 shootings at Marjory Stoneman Douglas High School in Parkland, Fla.
“What a lot of people don’t know is teachers are very limited in saying anything political, which is difficult because they have one of the most political jobs,” Hicks said, adding that every decision made about teachers’ lives from Common Core curriculum to arming teachers with guns is political. Hicks ordered the bus and posted on social media, asking for people to sponsor a seat for a teacher. Within a week, every seat was paid for by area parents and Representative Town Meeting members, Hicks said. 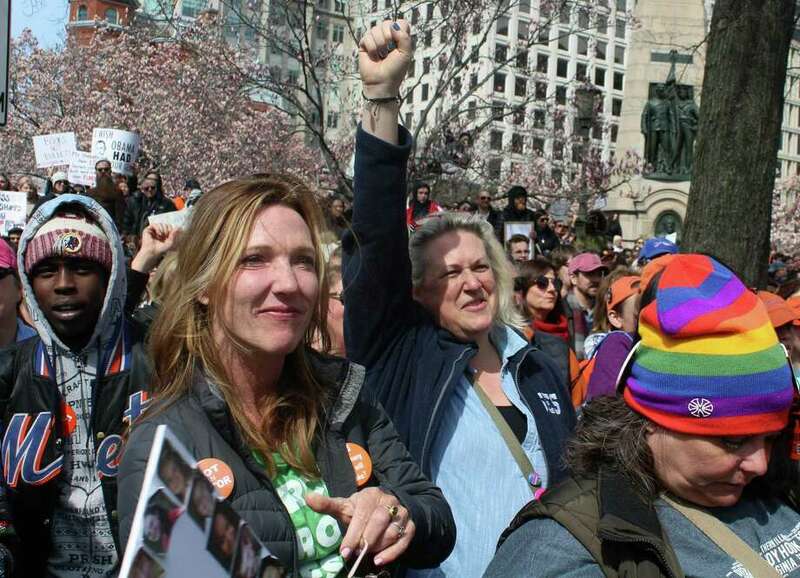 A 23-year veteran of the Westport Public Schools, Betsy Tucker, a music teacher at Long Lots Elementary School, said she felt compelled to attend the march. Co-president of the Westport teachers union, John Horrigan also took advantage of the free bus to D.C.
Due to Westport School District regulations, Horrigan said, teachers can discuss political events but not organize political actions, such as a walkout. Outside of school, however, teachers can engage in political protest, the Westport resident explained, adding that he traveled to D.C. to stand up against easy access to guns in America, which he said results in school shootings and people harming themselves and loved ones. Westport is not the only district to restrict teachers’ actions during the school day. New Canaan has similar stipulations. “I felt that even though I wasn’t able to walk out of school, I wanted to do something,” said Crista Rizzuti, an English Language Learner case manager with the New Canaan public schools. Kids already have to worry about so many things while growing up that asking them to worry about gun violence in schools is too much to ask, Rizzuti said. The Westport resident traveled to D.C. with her daughter Mimi Schindler and her daughter’s friend, Hannah Sachau, both eighth-graders at Bedford Middle School. On the bus back, Rizutti said her biggest takeaway from the march was a feeling of awe at the students who organized and carried out the demonstration. “I hope they persevere and keep the conversation in everyone’s ears,” Rizutti said, echoing a sentiment among many of the teachers on the bus that they wanted to lend their voices to support the student leaders. One such student working to make her voice heard was Anay Simunovic, a senior at Staples High School. “It’s nice to see the youth taking a stand for something the adults couldn’t accomplish,” said Simunovic, who rode the bus with her mom, Carlotta McClaran, a special education instructor at Stepping Stones preschool, and sister Ava Simunovic. Fellow Staples student Amanda Braverman also took advantage of the bus to D.C. and back. Each summer, Braverman attends Camp Starlight in Pennsylvania where Scott Beigel, a teacher shot in the Feb. 14 Parkland massacre, worked as a counselor. Throughout the protest Braverman held a large sign with Beigel’s name. “I’m feeling very emotional this many people came out. Everything said today needs to be felt and heard by congressmen,” the sophomore said. The youngest protestors on the bus, Schindler and Sachau, said they think about gun violence and what might happen at school most days, but were empowered by the protest. “Today was really inspiring and I feel good that I was able to participate,” Schindler said. Like the students’ speeches at the protest itself, many of the marchers on the bus said they participated out of the fear that democracy is in danger and with the goal of changing federal gun legislation. In the summer, Jeanne Bowles, a math specialist at Saugatuck Elementary school, said she’s going to help register people to vote. “This is an important time in history and I think the young people can change the course of history,” Bowles said. Staples High School government and history teacher Jeanne Stevens said it was nice to see how much an emphasis the young people at the march put on voting and changing gun laws at the ballot box. Connecticut has some of the strongest gun control legislation so it’s important to support legislation at the federal level, she added. “If we go state by state, it will take too long, that’s what happened with women’s suffrage. Federal legislation is the way to go on all of this,” Stevens said.